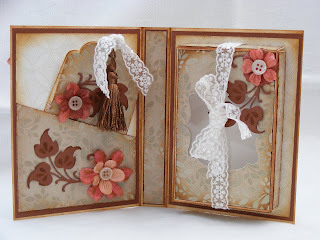 It seems like forever since I last managed to make anything for our poor neglected blog but as we all had to miss a couple of Craft Stamper issues and I didn't manage to take part in our last challenge I haven't actually posted a project until now for 2011. Shame on me!!!! If you are a visitor to my own blog though, you will know about all the preparations for our Daughter's wedding that I am involved with and it's now exactly 4 weeks away, Ooooer!!!! That and DT work has kept me rather busy but I hope things settle down again after the wedding. I have to confess to being a little excited now but also nervous which is a bit silly seeing as how I wasn't one bit nervous for my own, lol! Anyway, onto my project. As Judith announced in her last post, Jo chose Debbie Dolphin's project from the February Issue of Craft Stamper for us to tackle this time. I really enjoyed making this and as I am so short of time at the moment and Valentine's Day had already passed I decided to turn mine into a giftbox/card for my lovely Mum for Mother's Day. As time has been such a precious commodity recently I'm afraid I cheated! 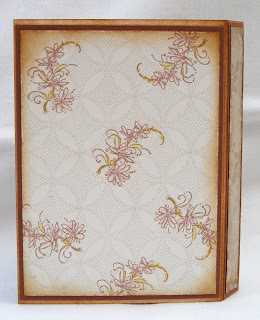 However, I did very generously use some gorgeous paper from another precious commodity ............. a stunning paper stack called The Linen Closet by DCWV. It's actually full of beautiful designs on lightweight card rather than paper. Some of them are wonderfully glittered and others are plainer to make for perfect co-ordinating designs and they are all in blues, greys, browns and beiges. Can you tell I rather like this stack, lol! I find it very difficult to cut into them because they are so lovely and so far have only used them for two very special people, one of my little Granddaughters and my Mum! I chose two different designs for this project, one of which is glittered and the other much plainer so that I could stamp onto it. In the photo above you can also see that I used a Marianne Creatable flourish leaf die and a lovely Go Kreate label die. The stamps I used are both from Hobby Art and I stamped with Sepia Versafine and added a little watercolouring using Distress Inks in Victorian Velvet and Peeled Paint (I think). On the larger of the images I also did a little decoupage. I distress the edges of my front cover before I layered the whole thing onto brown card and then onto the front of my project. 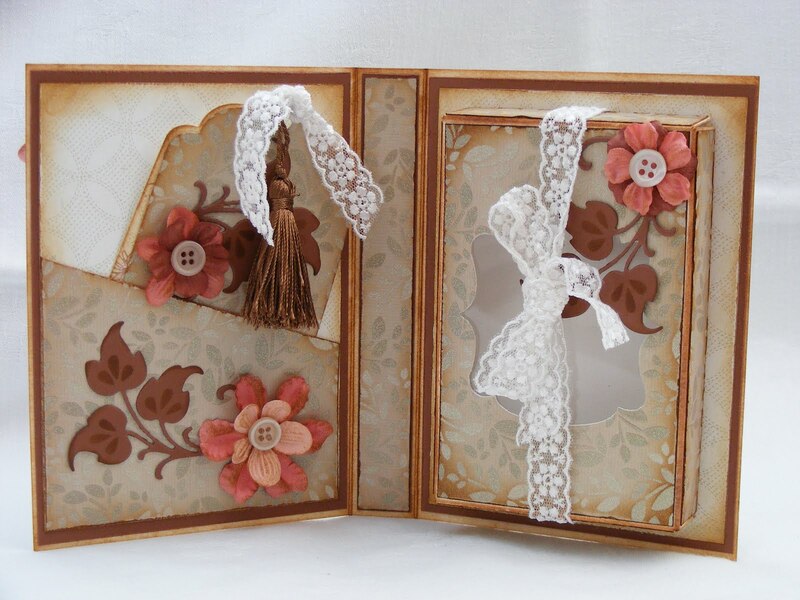 For the back of my gift I used the same dp, the smaller of the stamps, distressed the edges and layered on brown card again. Next I turned my attention to the inside and this is where I made good use of the beautiful glittered dp. 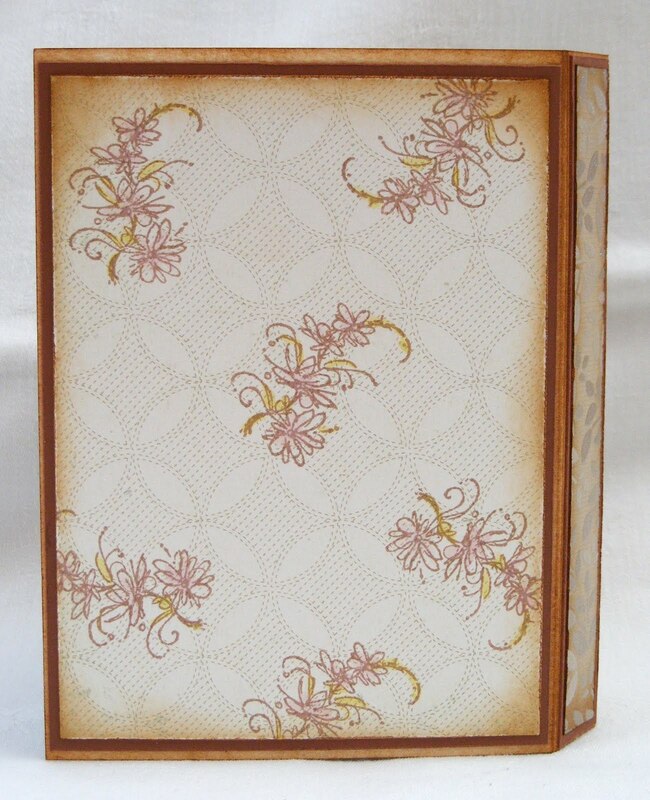 I used the Go Kreate die to cut the aperture on my box and some really pretty lace which in real life is actually more cream than white, more of the leaves and Prima flowers (lightly inked) to embellish. The glitter bp was also used to create the pocket on the opposite side. Finally I created my tags. 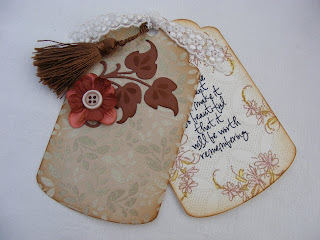 I used another Go Kreate die and cut a tag from each of the dps and stamped a favourite Stampers Anonymous quote on one, decorated the other and fastened them together with more lace and a tassel. I used the quote tag to write my personal message to Mum on the back. As Mum doesn't care too much for chocolates I decided to fill the box with a some of her favourite sweets (mine too, lol!) Liquorice and Blackcurrant but ................................ I forgot to take a photo once I had filled it. Needless to say the sweeties have all gone but Mum loved the gift box/card. It is still on display and could well be there in a years time. Like any doting Mum, mine keeps anything I make her on display until it drops to bits and as I make my stuff sturdy, that tends to be quite a while, Ha! Ha! Well, I'm glad I managed to complete this project because I was really pleased with it. Debbie did a grand job of the article in Craft Stamper and I thoroughly enjoyed adapting it for my own purposes. Thank you Debbie, I think I could well be making other versions of this in the future. Keep your eye on our blog because I know at least two of my buddies are not too far behind me with their projects and then we get to find out what Judith chooses for us to make next time. What a lovely pretty gift, Lesley. I too am very mean when it comes to using the nicest papers so well done for parting with these. I clicked to look at the glittered one close up and it is truly delightful. Your colour scheme works really well for this and I love those die cut leaves. I'll bet your mum was thrilled to receive this and it stays on display for a long, long time. Good to have your excellent work gracing our pages again. Lesley, well done for getting us started on this project. It's a lovely colour scheme and those papers work a treat. 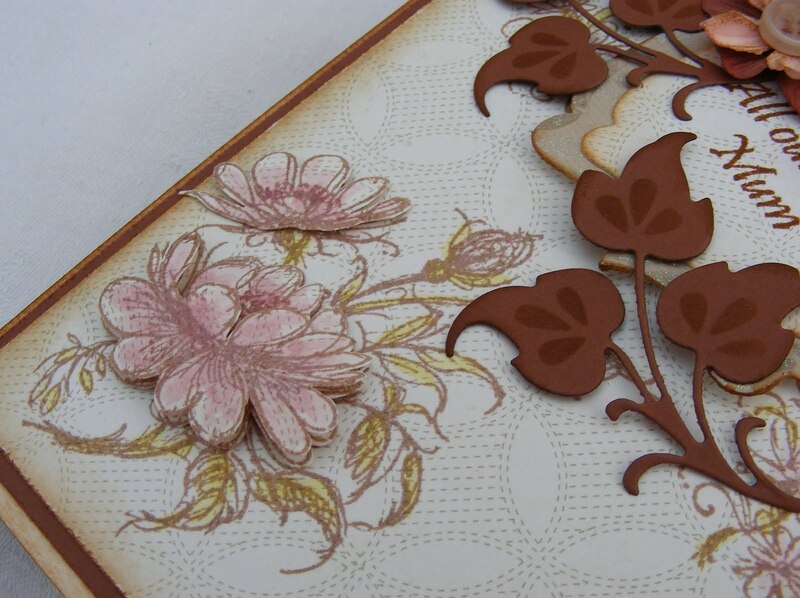 I am coveting that lovely leaf die - it adds a lovely touch to this project. I love all the different elements and as you know that quote is an absolute favourite of mine since you put it on my birthday card! I can imagine how thrilled you Mum must have been, especially filled with her favourite sweets. A great start to this project for us. 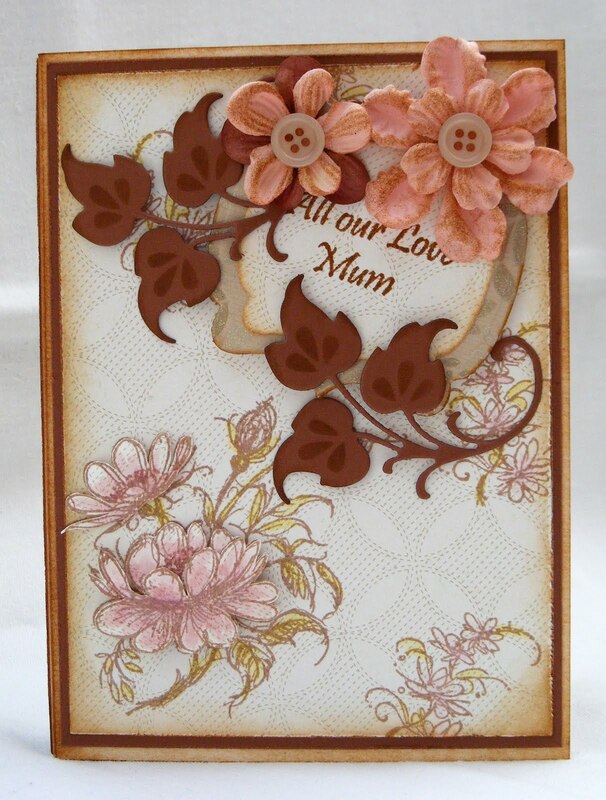 This is a beautiful gift for Mother's Day and such a lot of work and love has obviously gone into making it. Why do we all buy lovely papers and then hoard them instead of using them?? I know what you mean though about only using them for special people. very pretty and beautifully coloured Lesley. This is beautiful Lesley. You have a very lucky mum! 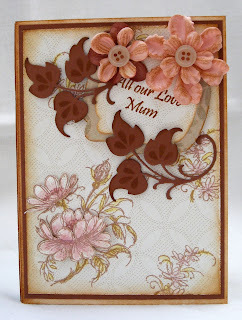 I love the colour scheme and the leaf die. Two more items for the wishlist. Fabulous! Love the beautiful stamping and design! Gorgeous warm earthy tones too! This is stunning, Lesley. Your Mum must have been absolutely thrilled with it. 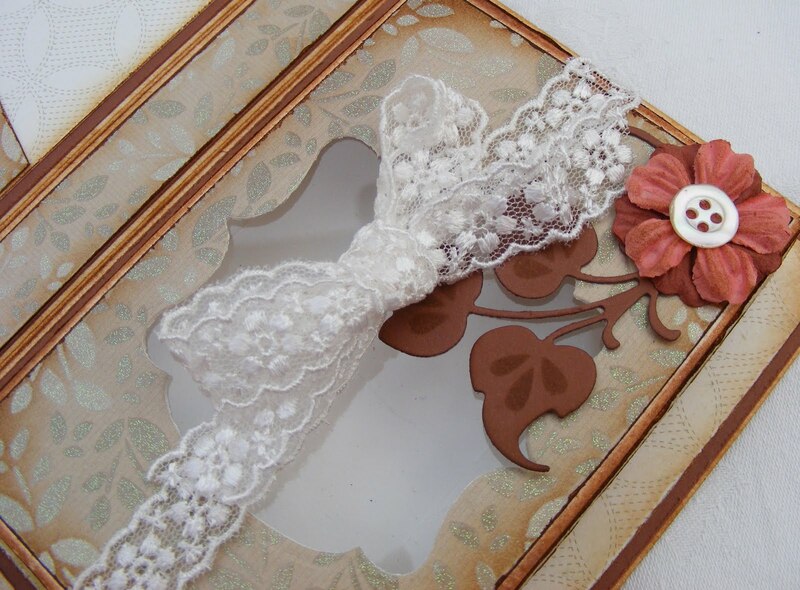 The papers are gorgeous like you say and I love the lacy touch. Beautiful Lesley, Debbies project is lovely and you've certainly done it justice. 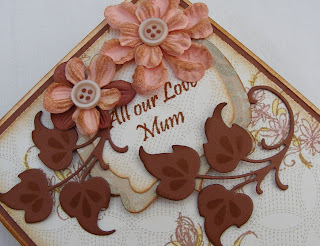 We did this in a stamping club session too but love your idea of choosing something from the craft stamper as part of your little friendly challenge- a great idea. Hope all is going well with the wedding preps and you're not too stressed. goergeous gift for your Mum. So glad I came over to drool, Lesley!! I love every inch of it! Beautiful!